MELEM USA LLC - WHERE YOU CAN BUY MELEM AT STORES﻿News: Melem is now a 5 star product for 5 star resorts: Melem is offered to guests in the Beho Beho Safari Lodge in Tanzania (5 stars on 2017 Tripadvisor) The owner writes in an email: "I am just off to Africa so very grateful that I still have Melem which completely takes away any itch that I might have after being bitten by mosquitos and Tetse Fly if applied immediatlely after feeling the bite. I think you should mention this in your promo". (Nov 29, 2015)﻿Melem USA has received special recognition as a winner for 2016 for its customer service and for meeting administrative citeria from its distributor to supermarkets and independent pharmacies, Cardinal Health. We are proud of the high standards we have set for our business and happy to see we are recognized for it. Likewise, we maintain our 5 star rating with Amazon. Our stick balm received a flag marker as an Amazon's Choice product in December 2016 and the large size has it in 2017. The flags are still flying in 2018 and Amazon has awarded all Melem products, rotating the flag between the four items. Read the customer reviews to see why. Melem USA has received special recognition as a winner for 2016 for its customer service and for meeting administrative citeria from its distributor to supermarkets and independent pharmacies, Cardinal Health. We are proud of the high standards we have set for our business and happy to see we are recognized for it. Likewise, we maintain our 5 star rating with Amazon. Our stick balm received a flag marker as an Amazon's Choice product in December 2016 and the large size has it in 2017. The flags are still flying in 2018 and Amazon has awarded all Melem products, rotating the flag between the four items. Read the customer reviews to see why. Retailers listed below have sold Melem over the counter in the past or are currently doing so. In supermarkets Melem is usually found at your pharmacy counter and it is usually not on the shelf with the other skin care products. It is an over the counter product for which you do not need a prescription. If it is not on the pharmacy counter, you may have to ask your pharmacist to order it for you. Give him/her the following information. 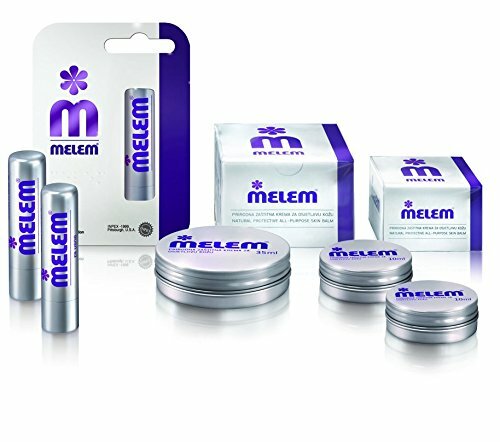 Melem balms are sold on Amazon, Prime, www.Amazon.com/Melem They have a five star rating, The Melem Lip Balm Stick carries the Amazon Choice flag. Currently Medicine Shoppes in the Colorado area carrying Melem are in Raton, NM and Colorado Springs. Do not want to buy a 3 pack or 6 pack, but just want one or two? Ask your Kroger (King Soopers, City Market, etc) pharmacist. If they do not have any in stock, ask them to order it for you through Cardinal Health. Also, see the place order page for the sample pack which has one of each format: Large tin, small tin, stick. (Item # 2007) The www.melemorder.com site has a list of the supermarket pharmacists who have now or have ordered Melem and other retailers who also carry it in Colorado and surrounding states, including Nebraska, New Mexico, and Montana. Below is a partial list of retail stores carrying Melem.. Melem may also be on the counters at many other fine restaurants and banks, ski and gift shops. For super markets, go to the pharmacy counter, not to the skin care aisle. Super markets listed may not always stock quantities of Melem, but they can order it via Cardinal and those listed have also done so in the past and may even have some in stock. If they have questions, show them the order catalog numbers on this page. SAFEWAYS: Note: beginning in April 2015, due to the merger of Albertsons and Safeway, there is a change in distributors from Cardinal to McKesson. Melem currently is not distributed by McKesson. There are supermarkets in the same area as most Safeways and other retailers that carry Melem. . Alternatives to the Fraser Safeway (below) For alternatives elsewhere, scroll down this page. In Fraser/Winter Park, the Fireside Market and Eatery, Trails End at ski area base, B Jammin in Cooper Creek Shopping Center, Shells in Fraser old town and also near Grand Park Rec Center are fully stocked as is Fraser Ace Hardware. In Granby,City Market and Java Lava. In Grand Lake, check the hardware store and Mountain Market, who may stock it in the winter but more likely in the summer. In Breckenridge, the Breckenridge the Skywalk Deli in Beaver Run. City Market in Dillon has also been active in carrying Melem. City Market and King Soopers pharmacies in the Denver Cardinal district, can order them for you through Cardinal Health. Melem is also carried by many pharmacies in Montana. List of supermarkets above updated March 2018. In stock again at Care Pharmacy, Grand Cayman, British West Indies. In addition to being sold on the internet via our own website and Amazon, non presecription Melem is available through pharmacists in Kroger supermarkets. We have just received an important award from the distributor we use to supply supermarket and independent pharmacies...Cardinal Health. We have been named a winner of Cardinal Health's 2016 award for "Cardinal Health Supply Chain Excellence (SCE).. award recognizes suppliers who consistently meet or exceed measurable criteria designed to guarantee customer satisfaction. Points are award based upon defined standards in each category. When those supplier achieve those points, Cardinal Health honors them with an award during our Business Partner Conference. Categories consist of: service level, lead time, chargebacks, PAR reporting, compliance with Consumer Health contract, quality, marketing, chargebacks, and EDI reporting. " To order Melem on the internet via the website, visitwww.melemorder.com. . This site uses the Pay Pal payment system. You do not need to be a Pay Pal member and it takes all credit cards. All prices include the price of shipping and handling. Melem is also sold at www.amazon.com where we maintain a five star rating and are Prime eligible. There are 42 five star customer reviews giving us five stars on Amazon sites. Take a look. Free shipping is still offered even if you are not a Prime member, but Prime membership gives you 2 day shipping in addition.